Yesterday’s flooding in Metro Manila and surrounding provinces was among the worst in recent memory. Lots of pictures and narratives were posted in the web like facebook. Here are some pictures in our place in Makati. Luckily, the flood in our street was only above the knee, while in other areas and cities, the flood would submerge a bungalow or even 2-storey houses. Then some friends started posting, “because of global warming/climate change”, “mother nature getting back at us”, “Sign the Copenhagen Deal”, etc. I countered with those friends’ postings, I argued that this is global cooling. If they read the Sun-climate link theory, they will realize that the Earth is approaching a Dalton Minimum type of global cooling -- for at least 2 decades. Since last year, even in previous years, there was little proof that there is "global warming" happening in the Philippines and other parts of the planet. Last year, strong, early typhoon “Cosme” (a local name) dumped huge amount of rainfall in northwestern Luzon and killed several people due to flash flood. That was in May. 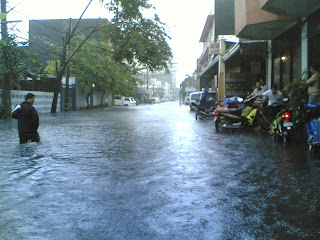 The next month, June 2008, typhoon “Frank” dumped heavy rains for around 10 days straight in Panay island (with 4 provinces), Sorsogon, etc. and it caused the sinking of a big ship, “MV Princess of the Stars” which killed around 1,000 passengers and crew. This year, there was practically no summer in the “summer” months of March-April-May. My friend who is in the business of manufacturing and selling umbrellas told me that she made big money since April this year due to the early start of the rainy season. Another proof: the rice farmers that I talked to last week in northern Luzon complained that with too much rains, their rice was growing well but after harvest, they cannot dry it because the Sun would hardly show up. When newly harvested rice is not dried the next few days, the moisture content would cause the unhusked rice to blacken and this will adversely affect the quality and taste of their rice. The selling price therefore, will be low. The heavy rains and flooding that happened yesterday was somehow, not too "surprising". These days, especially this month, we seldom see the Sun. There are always dark clouds almost everyday. Sometimes it's sunny in the morning, then would become dark by 2 or 3pm because of the thick clouds. Clouds, not smog. 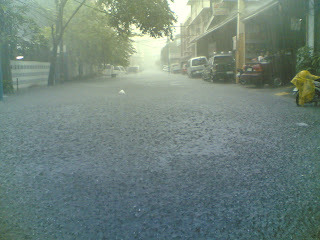 And even if our drainage are as big as jeepneys, there would stil be flooding because of the huge amount of rainfall. This climate alarmism is really a jerk. The UN and many governments, including the Philippine government, are warning the people and spending billions of pesos preparing for drought and hotter days, when we should prepare for the opposite -- too much rains and flood. And in temperate countries, long and severe winter. They create new carbon taxes, created big international bureaucracies like the UN FCCC and IPCC, they have plenty of international climate meetings in many countries and cities, instituted ecological central planning via the Kyoto Protocol and soon, Copenhagen Protocol/Agreement. Lie if they must, but they should continue scaring the public of global warming, which they later euphemistically called “climate change”. If interested, I have written/presented 2 papers on climate alarmism. a) This climate change is not global warming. This is global cooling. c) carbon dioxide (CO2) is not a pollutant. It is a useful gas. Here also, is a comprehensive report, http://www.climatechangereconsidered.org/. As the Philippines is reeling from the disaster caused by typhoon “Ondoy” hundreds of climate bureaucrats led by the UN FCCC (Framework Convention on Climate Change) are meeting in Bangkok, Thailand, since yesterday (September 28) up to October 9. The climate bureaucrats and negotiators are planning more ecological central planning, to be signed hopefully in Copenhagen this coming December. The current Kyoto Protocol is not enough for them, they want a post-Kyoto Agreement or Protocol to fight global warming which they now euphemistically call “climate change”. The goal of ecological central planning is very clear: more environmental regulations and prohibitions, more carbon taxes collection, more energy rationing, more and bigger climate bureaucracies at the national and international levels. The environmental planners will determine what kind of power plants we can put up and cannot put up. What kind of light bulbs to be used and which ones should not be used. How much carbon taxes to be slapped against “non-renewable” energy and how much subsidies to be given out to “renewable” energy sources. They keep scaring us the public that unless we listen to them, we are doomed to extinction. And for these environmental socialists, the Sun and its magnetic field, the cosmic rays from outside the universe, “biosols” and volcanic aerosols, do not exist or do not affect the Earth’s climate, that only CO2 and other greenhouse gases (GHGs) are the main cause of global warming. Why? Because they cannot regulate solar magnetic field, they cannot regulate galactic cosmic rays, they cannot regulate volcanic aerosols. There's no money and political power for governments and the UN there. Whereas demonizing and regulating CO2 gives them lots of political and ecological power. The environmental planners have made the global warming hypothesis a dogma. Even if both global temperature data (specially satellite data like UAH & RSS) and actual realities (like sustained rains in "summer" months, this heavy flooding) point to cooling, governments still collect huge tax money to sustain those national and international bureaucracies, their expensive frequent international meetings and agreements. There is a lot of coercion, lying and rent-seeking involved. Meanwhile, more than 100 people have been confirmed to have died, 106 as of 8am update by the National Disaster Coordinating Council or NDCC). There are reports that if we account for the missing, the death toll could reach 700. I replied to that post, I said that the government and its politicians have already spent the money preparing for global warming. They created new climate bureaucracies like the Presidential Adviser on climate change. Such Adviser (former Sen. Heherson Alvarez (and staff?) I think is travelling every 2 months abroad to attend meetings by the UN FCCC, other events organized by other governments. Since there will be drought, they constructed a number of dams (big and small), bought airplanes and chemicals for cloud seeding. Since there will be more hot days, perhaps they bought more powerful air-conditioners in their offices, more SUVs. Since CO2 is evil, they gave away big subsidies of taxpayers’ money to solar and wind farms, other “renewable” energy sources. But if they can only be more honest, if they will only look up the sky more often, they will realize that the problem is not from rising ocean many years from now. Rather, the problem is the thick rainclouds that are always in the sky, almost everyday, with or without a typhoon. The Sun would hardly show up as those clouds block the sunlight. Consequently, there is general cooling, and lots of rainfall. And why is this so? Because the Sun is not dead yet. Its magnetic field has become weak lately, less sunspots appear on its surface, its irradiance (or brightness) is slightly reduced, there is weaker solar wind. Solar scientists call it the “deep solar minimum” of this century. What is the implication? Weak solar wind to push away lots of galactic cosmic rays (from exploding stars) to reach the Earth’s atmosphere. Such cosmic rays help catalyze the formation of aerosols, which are the nuclei of seed formation. So more cosmic rays, more aerosols, more low-lying clouds, less sunlight to reach the Earth’s surface, more rainclouds to fall anytime, global cooling. There are many other natural factors that also contribute to more cloud formation. Geologic de-gassing and release of volcanic aerosols, release of gases from plants and trees that form “biosols” (aerosols from biological sources). Although their contribution is lesser compared to solar factors. None of these natural factors are ever considered by the UN and those government leaders who are planning ecological central planning. So even with global cooling happening, they still insist that the world should prepare for global warming, meltic ice and snow, and rising ocean. a. reduce if not abolish income taxes, let us keep our monthly or yearly income and allow us to build stronger houses against more heavy rains, against colder weather in the coming years and decades. b. strengthen river banks, dredge heavily silted rivers and creeks, make them deeper again, so they won’t swell easily in anticipation of more heavy rains and more flash floods. There are dozens of consumption-based taxes and transaction taxes (VAT, excise tax, travel tax, doc stamp tax, franchise tax, etc.) where government can still collect big revenues. c. build higher roads, cover up cracked and potholed road with a new layer of new roads on top, instead of removing the old layer and build a new road on the same elevation. I got this email from a friend who used to own a travel agency here in Manila. The email she got from her former boss who is a respected player in the travel agency sector. Other than that, I have no way of verifying how true this story is, but judging from the quality of governance in this country, especially the Bureau of Customs, I think this story is between 90 to 100 percent correct. Here's the message, my English translation (for my non-Filipino reader friends) of the Filipino sentences below it. Would like to share with you what we found out as the reason why cruise ships of the big cruise companies skip Manila . My wife and I are regular cruisers and we always talk to the Filipino crew. When we took the 12-day Mediterranean cruise I asked the Pinoy waiters (because we are in a big group, we usually request for Pinoy waiters to be assigned to us) why all their Asian cruises skip Manila when they go to all the neighboring countries of the Philippines . Tanong ko bakit ba wala sa itinerary ninyo ang Manila . experience ang ganoon kaya nahihiya ho kaming mga Pinoy dito sa ship. Sa ibang ports sa Asia wala hong nang hihingi. The new cruise ships have an everage of 2,000 to 3,000 passengers. Imagine the loss of tourism revenue for the Philippines because most cruise ships do not go to the Philippines . Pero paano mapapatino ang mga taga Customskung ang manga taga Malacanang, Congreso, governors, mayors who should set good example sa government service pareho din nila at mas malaki pa ang kurakot? Author: Why is Manila not in your itinerary? Filipino crew: Earlier, we have cruise ships that stop in Manila, but the (Bureau of) Customs people are too greedy, so our management decided to skip Manila. When inspection time comes upon our arrival and departure, the Customs inspectors bring their families to eat free in our ship. And before they give the clearance for departure, they ask for lots of free cigarettes and liquor. We only experience that in Manila and we Filipino crews are ashamed in the ship. In other Asian ports, no one extorts. I see a contradiction between Sen. Mar’s 1st and 2nd sentences. The first wants to encourage entrepreneurship and free market capitalism. The second discourages some entrepreneurs by accusing the pharma industry of abuse, and the subsequent moves by Sen. Mar to force drug price control. Price control is a favorite advocacy by the socialists and socialist-leaning groups and individuals. They believe that competitive capitalism is not working and should not be allowed as much as possible because this will later result in the emergence of monopolies and oligopolies. But monopolies are almost always created by governments – through executive or legislative franchising, so that other potential players are shut out. Sen. Noynoy is closer to liberal philosophy than Sen. Mar. The former has few interventionist legislative proposals, while the latter lately sounded like a liberal-socialist. So for now, my vote will go to Sen. Noynoy for President, and will still think of the VP candidate. Patients' vested interest: more choices. that the "mandatory" car for medical representatives ("med reps") is a perk that he feels can be done away with, along with various incentives to physicians/dispensers. And that the current "live rep push-marketing and (effectively) payola incentive schemes cost more." Middle of last month, there was a social dialogue between civil society groups (including those under CHAT) and the Pharmaceutical and Healthcare Association of the Philippines (PHAP). Officials of PHAP explained their "Code of Ethics" that apply -- with penalties and sanctions to violators -- to their member-companies. Even PRRM chief and former Sen. Bobby Tanada, former DAR Sec. Obet Pagdanganan, were surprised to hear about the strict code being imosed to member-companies. If companies are not happy with the Code, they can leave PHAP anytime. PHAP officials and officials of some MNC pharma who were there were emphatic that for payola-type and other unethical promos by pharmas, "at least 85% probability, they are not PHAP members". Personally, I have heard admissions from some local pharma how they go out of their way to attract physicians. Since they are not MNCs and have no global brand or corporate name, it's difficult for them to get physicians' patronage, unless you are Unilab, the biggest pharma (you combine the sale of top 3 MNCs in RP like pfizer, GSK, another one, Unilab's sale is the same or even bigger). I guess the use of med reps is inevitable. Unlike t-shirts, shoes, underwear, ballpens, etc., where an ordinary shopper can scrutinize these products in terms of price and quality, medicines are another stuff. Not even the best lawyer or the best solar physicist can analyze the properties and characteristics of what's inside those tablets, capsules and bottles. So physicians are sort of "guided" by the med reps sent by the drug manufacturers, or physicians are invited by the manufacturers to some continuing medical education (CME) to introduce their new products. There are costs to all those activities, so the producers pass on those costs to us, patients. In addition, because of the growing competitive nature of the local pharma industry (thanks to the generics law), manufacturers have to embark on certain ads and marketing, otherwise their competitors will beat them. When manufacturers give cars to their med reps, maybe this is to also protect the quality of the drugs that those sales people bring. Most medicines require a particular temperature control, say below 25 C always. So an air-con car will help preserve the quality of those drugs. If the med reps wait several minutes under the sun to wait for a taxi or jeepney or tricycle, the quality of those delicate medicines may be affected. So the patient will still not be healed quickly from those sample medicines. I dont know what else are the factors that manufacturers and distributors consider. It's not my field. Mine -- and ours -- is on public policy. Let the various players over-spend or underspend if they must, it's their business and it's their money that will be lost if they make bad business decisions. Our business as watchers and researchers of government policies, is to expose and fight those regulations that kill competition. As consumers, we have our own vested interest -- more choices. Let there be 200 or 400 different medicines against hypertension, and allow us consumers, our physicians or other health advisers, to decide which of those 200+ medicines will best fit our particular health needsgiven our budget and other health conditions. Government should not bow to the health socialists who want to kill competition via rigid and coercive policies like price control and compulsory licensing. There were at least two newspaper opinions on the drug price control subject recently in Philippine papers, below. The first is from Ding Generoso of Business Mirror last September 2. The second is from Cito Beltran of Philippine Star last September 14. Both have unkind descriptions of the current drug price control policy. Earlier, Peter Wallace of Manila Standard also wrote an opinion about the subject. If we list down the various forms of economic controls by the government -- rent control (max rental), wage control (min wage), fare control (max fare), drug price control (aka MDRP), possibly soon oil price control -- coupled with uncontrolled taxes and fees, uncontrolled bureaucracies and regulations, and of course, uncontrolled corruption, one may wonder if the Philippines is racing not with Singapore, Thailand, Malaysia, HK -- but with Laos, Cambodia and Myanmar. I wrote an article last week on a similar topic, "Marx, Hayek and Property rights". It shows some result of the recently released "Economic Freedom of the World 2009 Report". Similar ugly result, RP among the laggards, among the most bureaucratic and socialist-leaning policies, weak in the promulgation of the rule of law, and protection of private property. Gloria and the socialists, they have a number of things in common. Meanwhile, I heard that the DOH is considering expanding the list of drug price control. If DOH Sec. Duque will run for the Senate, I think this not a far out possibility. Let's see and observe. Sooner than later, the government would have to review the cheaper-medicines law. But before I get misunderstood, let me state clearly that I am not against bringing down the prices of medicines. I am all for it. I just don’t agree with the solution the government offers, because it does not address the root of the problem. Mayon Volcano is the perfect analogy for the brooding discontent among many sectors involved in the manufacture, distribution and sale of medicines in the Philippines. I make the analogy between Mayon Volcano and all the people directly or indirectly involved in the production and sale of medicines because I recently returned from Naga City where I had a chance conversation with leaders of the Drug Stores Association of the Philippines (DSAP). Just like Mayon Volcano, these ladies were a very unhappy and grumbling lot. There was a good article two months ago at the Inquirer on the dramatic growth of Gawad Kalinga (GK) in the Philippines. Now there are 2,300+ GK villages in 400 towns in the Philippines according to prime GK advocate. The news report also narrated how some local politicians ride on the GK bandwagon, whether for serious or opportunist reason. I am not sure if those local and national politicians that hitch with the GK bandwagon understand that there is something in GK that is not present in government service: instant accountability. GK lives off on pure donation, voluntary contribution. Once the donations are gone, GK is gone. Government on the other hand, lives off on taxation, mandatory and forcibly collected taxation. Such revenues can never go dry, so the bureaucracies can never fade away. GK people are driven by pure customer satisfaction. Their "customers" are the thousands of private donors who have extra money to give away if they are assured that their donations are well spent and not stolen or wasted. If those donors sense something is wrong, there is the instant result of donation reduction or evaporation. Whereas in government, there is rigid and looongg process of finding out accountability and wrong-doing, if ever. I know a Pinoy friend from LA, who has been helping GK for the past 6 to 10 years now. He's on the lookout how the projects that he's supporting is going. A single news that he can confirm that the money is wasted in a par ticular GK project, he stops donating to that community, rechannels his contributions to other GK communities or other humanitarian projects. He even tells his other friends who give the same donation, so the news of wrong-doing can easily spread. Although so far, instances of wasteful GK projects are very few and isolated. It's like Rotary, Lions, Masons, other private charity and civic groups, other civil society organizations (CSOs). They live off on pure voluntary support, membership and contributions. The moment a club or a district misbehaves, the "punishment" in the form of reduced membership may not be instant but can build a momentum. More serious politicians who strongly believe in the GK spirit should consider drastically cutting the taxes and fees (local or national) that they impose, encourage investor confidence that results in more investments, more entrepreneurship, more job creation in the local community or the country as a whole. In relation to my earlier discussion on taxes on medicines, I posted in our CHAT googlegroups that our think tank, Minimal Government Thinkers, does not solicit or receive any government money (local, national, foreign aid). A think tank or NGO that does not receive any tax money can be a tax activist anytime. When the WB Philippines proposed -- and reported in the newspapers -- that the excise tax on gasoline (currently around P4.50/liter) should be hiked in order to help reduce the budget deficit, I posted a commentary in this blog and sent it to my various ygroups, cc'd my friends working or used to work in WB Manila. I said that the WB is a parasite for proposing such measure to further raise gasoline prices when many sectors are already debating or fighting each other how to bring down gasoline prices, how to bring down the fares in public transpo, etc. I think the Department of Finance (DOF) also did not entertain their proposal. If MG Thinkers receive funding from the WB, IMF, ADB, UN, USAID, AusAid, etc., it's difficult to become a tax activist because ALL of those institutions live off on tax money. Or difficult to attack international bureaucrats because ALL of them are international bureaucracies. One NGO leader narrated their experience. Early this decade, they campaigned for the removal of the tax for one anti-cancer (leukemia) drug. They succeeded, but he added that it did not result in price reduction, rather the prices of such drug kept rising. So he concluded that only the pharma company, not the patients, benefited from the removal of taxes on medicines. Those books from America were donated FREE. Those books will be distributed to public elementary schools in rural areas of the Philippines for FREE. 1. Customs duties around P65,000 -- yes there are taxes for donated and used books! 2. Customs broker around P60,000 -- an agency that deals everything with the Bureau of Customs (BOC). The BftB Manila staff who narrated me that story last year, said that what's worse, donated medicines and vaccines by volunteer medical missions from abroad, many of them are parked at the Customs area and allowed to deteriorate. Why? Those medical missions and volunteers have money for the airfare of the volunteers and shipment of free drugs and vaccines. But they never expected there are high taxes and Customs brokerage to pay for those donated medicines, so they did not bring money for such. Those vaccines are on refrigerated containers that run on electricity, of course. Since they cannot pay the taxes, and the medicines require continued electricity while the papers and payment are being processed, the BOC personnel disconnect the electricity as electricity charges are being borne by the Bureau. Within hours, those useful, essential, life-saving medicines become useless as they need to be kept at a particular temperature (say 0 or 10 Celsius). When the temperature goes up or down significantly, the medicines become ineffective for their intended patients. For the imported anti-cancer drugs that the NGO leader above was talking, I think only the import tax (5%) was waived. This tax is collected by the BOC. On top of the import tax, there is the 12% VAT, also collected by the BOC in behalf of the BIR. This bigger tax has to be paid to the BIR even if the import tax or customs duties is waived. For the pricing of whoever is the pharma company that sold that medicine, when it is the single seller or distributor of that medicine in any country, that is tantamount to a monopoly. A monopolist would tend to abuse its position and price its product at any level it wants to, considering demand elasticity (or responsiveness of consumers to changes in prices), size of the market, and purchasing power of that market. Government is an example of a monopoly. It can set its price at any level (personal income tax at 32%, corporate income tax at 35, down to 30%, travel tax at P1,620, with or without any service to the Pinoy traveler, etc.). The solution to a monopolistic industry structure is more competition. Allow other players and producers to come in. As I have posted before here, there are hundreds of other multinational innovator pharmas, and tens of thousands of generic pharmas, that are not in the Philippines yet. India alone has more than 22,000 pharma companies. Its biggest pharma company, Ranbaxy -- like Unilab, the biggest pharma co. in the Philippines -- is not even here when Ranbaxy can put up stiff competition to anybody here, both local or multinational pharma. I opined that the posting by said NGO leader was not to discourage the pursuance of abolishing taxes -- both import tax and VAT -- on medicines. This government hypocrisy need to be stopped. We all want cheaper medicines, so taxes that hike medicine prices, and regulations that kill competition, should be scrapped. The guy replied, that even if the 5 percent import tax was waived, the anti-cancer drug price did not go down by a corresponding 5 percent. So he reasoned out that if the 12 percent VAT will be removed, then the profit of the pharma company/ies will become even bigger. He further argued that when government tax revenues fall, it's the public who will suffer because the government will have lesser money to develop the country. Typical statist, if not socialist, argument. This logic says that government should tax and tax as much as possible on everything. Anyway the money will be used by the government for the public. This is actually one perspective being embraced by many civil society leaders who hate free markets and competitive capitalism, they want more government intervention, regulation and taxation. More government responsibility to assume a big Nanny role. So those civil society leaders come to the defense of the State for ever higher taxes, including high taxes on medicines even if the same NGO leaders are supposedly campaigning for "cheaper medicines". It will not be far that these NGOs receive lots of funding from the government -- national or foreign aid. As I posted earlier in this blog, such NGOs are NOT exactly "non-government". They are more of government-funded organizations (GFOs) although the funding is not direct. Usually through an international NGO that gets foreign aid funding, then channeled to national NGOs. Below is a news report, an initial assessment of a month of drug price control policy by the Philippine government. Watsons drugstore says business was good, the federation of small and independent drugstores, DSAP, says they're bordering on bankruptcy. Private Hospitals Assn. of the Philippines(PHAP) also complain, while the Pharmaceutical and Healthcare Assn. of the Philippines (PHAP) and the Philippine Chamber of Pharmaceutical Industry (PCPI) have relatively neutral statements. But for the first time, I read that the DOH, through USec Padilla, is talking to the Department of Finance (DOF) re government taxation of medicines, especially the 5 percent import tax and 12 percent VAT. Theoretically, the DOF can't just remove the VAT on medicines because you need a new law amending some portions of the national internal revenue code (NIRC) to say that medicines should be exempted from VAT, also amend the tariff and customs code to say that medicines should be exempted from import tax. These cannot be done by administrative measures, only legislative measures. But then again -- if no one will protest and object -- the DOF can possibly issue an administrative order temporarily exempting medicines from VAT, until a new law is enacted. But such law will have to wait for the next Congress starting 2010. It's important that government double-talk of "cheaper medicines" and expensive medicines via taxation be corrected. Taxes always distort prices upwards. Govt. can double the taxes on alcohol and tobacco products, but abolish the taxes on medicines. BIG pharmaceutical companies, which feared the worst with the cheaper- drugs law, are slowly seeing a window of opportunity one month after the government fully enforced an executive order implementing the year-old law: the window is in the tradeoff between much lower prices, but bigger sales volumes. Small drugstores, however, are complaining, and claimed the combination of cheaper prices and the mandatory senior-citizen discounts are driving them out of business. Today, the actor of 2 famous movies "Dirty Dancing" and "Ghost", Patrick Swayze, died. He was 57 years old. He died of pancreatic cancer. He was diagnosed of that killer disease sometime 1 1/2 year ago. And today, a number of my friends in facebook expressed their sadness for the death of this good looking and talented actor. Me too. One friend posted in her facebook status today this quote from the actor before he died: "I've had the time of my life. No I never felt like this before. Yes I swear it's the truth. And I owe it all to you." Pavarotti also succumbed to pancreatic cancer. I know of a rich lady here in Manila, a good friend of my sister, had pancreatic cancer. When it was detected early last year, she was on stage 4 already. Within 4 months she died. A famous Filipino action star, Rudy Fernandez, also died of this disease. Former Philippine President Cory Aquino died of colon cancer just recently. My sister in law died of colon cancer too, about 4 years ago. She's the wife of my elder brother who died of prostate cancer a few months after she died. Some leftist guys push for IPR and patent confiscation of important medicines via compulsory licensing (CL) plus government-imposed price control. They say that many poor people die of cancer and other killer diseases because the medicines against these diseases are expensive, because of the profit-hungry multinational pharma companies that invented those medicines. Well, cancer and other killer diseases do not choose their victims. Rich and poor, men and women, they can die. A number of rich people also die of those diseases even if they have the money to pay for those expensive medicines. Like Patrick Swayze and Pavarotti. Like former President Cory, action star Rudy Fernandez, wife of super-rich Congressman Charlie Cojuangco, Rio Diaz, who died of breast cancer. Like former Philippine Senator Robert Barbers who died of throat cancer. And even the wife of the owner of Mercury Drug, the biggest drugstore in the Philippines, also died of cancer. Money can't kill cancer yet. That's why we need more medicine innovation, and patent-confiscation demand by the left does not help in encouraging medicine innocation. Diseases evolve, people's lifestyle evolve, medicines should also evolve. Demonizing the medicine innovators as blood-hungry multinational capitalists is wrong. They are capitalists, yes, and capitalists produce things which are most needed by humanity and in the process, they make profit. It's among their incentives for doing so. Higher tax on tobacco and alcoholic products are among the very few government measures and proposals that I support. In exchange, I wish to see government to drastically reduce if not abolish, income tax, both personal and corporate. At the House of Representatives, it is rushing the tax on texts, P0.05 per text. It seems to be rushing also the revised taxation of alcohol and tobacco products. I support further taxation of cigarettes and alcohol. I do not support tax on text messages. And I do not support continued taxation of medicines. Most governments, including the Philippine government, are a bunch of hypocrites. They say, 'cheaper medicines" but slap multiple taxes on medicines, raising medicine prices by at least 13 percent of their retail price. They say, "good health" but they are too timid to raise further the taxes on alcohol and tobacco products. I don't smoke, but I drink, and I wouldnt mind if government will raise the tax of my favorite vitamin B, beer. They say "cheaper telecomm services", but they over-regulate the entry of more telecom players. Singapore with only 4 million people has about 4 or 5 competing players, the same with HK which has only 7 million people. The Philippines with 92 million people has only 3 telecom players. And now the government wants to tax text messages, and introduce new taxes on telecom firms, while some local governments want to impose excise tax on telecom firms in their localities. I buy the P500 globe pre-paid card. I buy it only for P490 but I get P500 load + 85 free texts, for a total value of P585, or a savings of P95 or 19.4 percent discount. I feel that it's not enough discount, but it's better than nothing. When I send out the 85 free texts, the telecom firm (Globe) does not get a revenue from it as it is a promo text. Will it still pay P0.05 tax for it? I assume that the answer is Yes because most government regulations are stupid, they cannot distinguish promos from paid services, and there are dozens of promos from each player, like the telecom firms. Of course, the biggest hypocrisy of governments, especially the RP government, especially under the Gloria government, is large-scale corruption and robbery. But then again, government hypocrisy can be directly proportional to the hypocrisy of the public and the media that are supposed to be fiscalizing it. So what if the government is a theft and a hypocrite, so long as they get their own share of political favors? Aside from taxation, other forms of government intervention are regulations. Regulations by nature, are prohibitions. The regulators are saying, "Don't move, don't start anything, unless you get our permission, our certification, our signatures. And unless you pay us taxes, duties, fees (and sometimes, fines). if it continues moving, regulate it. if it stops moving, subsidize it. The best healthcare program in any society is preventive. Don't over-smoke, don't over-drink alcohol and soda, don't over-sit in sedentary lifestyle, don't over-eat fatty food, don't engage in frequent fights and rumbles, don't live in dirty places or do not allow dirty things around your house, don't eat without washing your hands well, don't live promiscuous lifestyle, don't rest too much and work little and expect public healthcare anytime. That is why I always argue that healthcare, first and foremost, is personal and parental responsibility. Government responsibility is secondary, like in cases of spread of infectious diseases, taking care of those with physical and mental defect, those who are very poor and have congenital diseases, etc. And that is why I don't believe in health socialism. The productive and those who take care of their body should not be over-taxed to pay for the healthcare of those who over-drink, over-smoke, over-fight, etc. who contract lifestyle-related diseases. Let the latter pay for their own medication and healthcare, otherwise they suffer certain diseases because they wished for it, they desired for it, they perfectly knew that all those cigarettes and alcohol and illegal drugs and high cholesterol food, etc. will mutilate their heart or intestine or other internal organs someday, and yet they continued doing it. Then government resources will be focused on a few, deserving sickly people who need public healthcare. I won't mind paying taxes so the govt can take care of patients with epilepsy or autism or the blind. But health socialists and many politicians and government bureaucrats want across the board subsidy for all. That is why more private healt insurance should be encouraged to foster more competition among those players, and to foster personal responsibility in healthcare. Government health insurance can stay as 2nd-tier or back-up insurance in cases of hospital confinement and serious health problems. About the telco tax, the usual alibi is that the telcos are making big profit. If this is so, then it only means one thing: there is lack of competition in the telecom industry. I posted it earlier: Singapore with only 4 million people has 4 to 5 major telco players, while the Philippines with 92 million people has only 3 major players. Even Indonesia has about 6 to 7 major players competing against each other. I was told by my friend who goes to Jakarta often, phone calls there are a lot cheaper there. It's cheaper for her to call her friend in Manila from Jakarta, than when she calls her friend in Manila from Manila. The solution therefore, is not additional government regulations like additional taxes. Rather, less government regulations and more competition. Let more big telcos come in. Orange of UK, Verizon of the US, etc. are big enough telcos to pose serious competition to the incumbents. If the government is serious in bringing down the cost of telecomm calls and text messages, more competition, not more bureaucratism, is the quick and cheap solution. But then again, we are talking about hypocrites here. Public servants, backed up often by equally hypocrite public and media (and a number of socialist-inspired civil society groups) only want more taxes, more power of intervention. Their hatred of capitalist competition is directly proportional to their self-serving ego that they can plan and manage things from the top. I still wish to hear more civil society groups and media lambasting government hypocrisy in slapping high taxes on medicines and health care. I got at least 2 testimonies from 2 of my friends in facebook. My obese self from last year had blood pressure which could run up to a whopping 190/110. Now it's consistently around the 125/75 level. For those who need to lower their blood pressure, there's no need to lose 50+ pound...s like I did. Just eat healthily, take daily walks, and manage stress: that should do wonders for your blood pressure and overall state of health. For this type of people, PhilHealth and their private HMO (if they have one) should be making lots of money: they keep contributing every year but never get sick. The pharmas (multis or local) are also not making money from them because they take little or zero medicines. Just affirms the importance of personal responsibility in healthcare. Government responsibility in healthcare, while giving health insurance to the poor, also gives millions of pesos of stolen and laundered money to many politicians and some govt. health personnel. Meanwhile, I heard one time when I was stil working in the House of Reps a decade ago, that a big portion of the leadership of the Committee on Ways and Means was under the payroll of Lucio Tan. One indicator was that the Chairman or senior vice-chairman can be absent on Committee deliberations on many tax bills, but NEVER on tax bills on cigarettes. Recently, the EU and the US want to sue the RP govt. to the WTO for double standard in the application of excise tax on liquor and spirits. The excise tax for local alcoholic products is 30% but 50% for imported products. For me, this is wrong. Excise tax is a domestic tax, and there should be only one rate for all products in the domestic market. If the govt. wants to practice alcohol protectionism, it can do it by raising the import tax, but not the excise tax. But when govt. raises the import tax for alcoholic products, it will encourage more alcohol smuggling. This is because even the most corrupt Customs and Malacanang officials want cheaper imported wine, whiskey, beer, etc. for their own belly and their friends'. Honest people change their position when the data that stare them in the face are contrary to what they previously thought. Dishonest people don’t. They only make totally different interpretations of existing data. 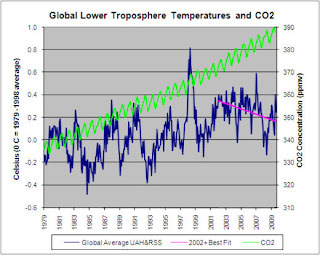 Above is a chart comparing global temperature and carbon dioxide (CO2) levels in the atmosphere over the past 30 years, latest figure is August 2009. Temperature is from satellite data, UAH and RSS, measured at the troposphere, 8 kms. from the surface of the Earth. Data is from Mauna Loa, Hawaii. The above chart shows one glaring fact: Global cooling continues despite increases in CO2 concentration in the atmosphere. From January 2002 to August 2009, the best-fit line shows cooling of 0.24 C, whereas CO2 concentration is now close to 390 parts per million (ppm), from only 285 ppm at the start of the Industrial Revolution two centuries ago, and around 385 ppm just about two years ago. But even at 390 or even 400 ppm, this ratio is still very small, only 0.04 percent of total gases in the atmosphere. This year, it has been mostly cloudy and often raining. Like the first 12 days of this month. There were two typhoons (local names “Labuyo” and “Maring”) that entered the Philippine area of responsibility this month. Although they did not make any landfall, both typhoons dumped lots of rain in Luzon, Metro Manila and almost the entire country, causing heavy flooding and landslides in many areas, and causing several casualties. Meanwhile, the Sun continues its deep solar minimum. In 2007, 44 percent of all (365) days have zero sunspots. Last year, it rose to 73 percent and this year, from January 01 to September 10, 80 percent of all days have zero sunspots. Some solar physicists and other scientists are even asking if sunspots will disappear in the next few years. Sunspot activities are indicator of the strength, or weakness, of the Sun’s magnetic field. Weak solar magnetic field results in few or zero sunspots and weak solar wind, etc. Now there are plenty of galactic cosmic rays coming from exploding stars that travel in the universe, some of which reach our planet’s atmosphere. Such cosmic rays help catalyze the formation of low-lying clouds. When there are more of them in the atmosphere, more low-lying clouds are formed. And there are more of them when solar magnetic field and solar wind is weak to push the cosmic rays away. When there are plenty of low-lying clouds in the sky, (a) direct sunlight is blocked from reaching the Earth’s surface and is reflected back to the outer space, and (b) more rains are falling, resulting in global cooling. At solar maximum, solar wind would be traveling at around 600,000+ kms per second. With the current prolonged solar minimum, solar wind speed is only around 300,000 to 400,000 kms per second. According to one Australian scientist, Dr. David Archibald (www.davidarchibald.info), there is a lag of 1 year from sunspot activities to the formation of low lying clouds. A deep solar minimum became more pronounced from August to December last year. Many scientists including those from NASA thought that solar cycle 23 (one cycle would average 11 years to finish then move to another cycle) was already over, so that by January this year, solar cycle 24 was suppose to have started. They expected an uptick of solar activity. The reverse happened, the deep solar minimum continues up to these days. So the current frequent cloudy skies – despite the fact that an El Nino is occurring this year – could be explained by the weak solar magnetic field late last year. And since the deep solar minimum continues up to this year, then we can expect that cloudy skies, frequent rains and colder climate will extend up to next year, and the coming decades. It has been the behavior of the Sun that in a solar cycle with deep and prolonged minimum sunspot activities, the next two cycles (ie, solar cycle 24 and 25, corresponding to 2.5 decades) will also be weak. And so, global cooling is expected to last for the next 2 to 3 decades. Meanwhile, many governments around the world and the UN are busy with almost bi-monthly expensive global meetings in preparation for the UN Framework Convention on Climate Change (UN FCCC) meeting in Copenhagen, Denmark, this coming December. The goal of such big meetings is for various governments to plan and sign a new global climate deal that will succeed the Kyoto Protocol which will expire in 2011 or 2012. They just held a meeting in Bonn, Germany last month. Their next meetings will be in Bangkok, Thailand, this coming September 28 to October 9, and another meeting in Barcelona, Spain, on November 2 to 6, before they move to Copenhagen in December for the penultimate meeting. These government and UN negotiators believe that there is already a "consensus", that “scientific debate is over”, as signified by the UN Intergovernmental Panel on Climate Change (IPCC) reports, so that politics and politicians will now take over to curb as much carbon emission as possible to “save” the planet. For the UN IPCC and global politicians, our Sun is a static and non-changing star whose job is only to give sunlight during daytime. It is the non-recognition of natural factors – the Sun’s magnetic field and sunspot activities, volcanic eruptions and geologic changes, the ocean – as the main drivers of the Earth’s climate that betrays the evil design of those governments, the UN and the various environmentalist groups. Their grand design is to create and tighten more environmental regulations, to enact new carbon taxes, and to impose ecological protectionism. In short, to arrogate more political power into their hands, to collect more money for them and their favored corporations and banks which are engaged in carbon offsets and carbon trading. Since there is no scientific consensus yet as more scientific data and studies that discredit the man-made warming theory of the UN IPCC and various governments come up, then those expensive global meetings and the forthcoming Copenhagen meeting, should be scrapped. They are unnecessary and only prolong the big scam that they themselves have invented. The pre-defined political agenda of governments and the UN – to regulate and ration energy sources, to collect more climate-related taxes, to play God to "save" the planet – becomes more indefensible with each passing days and months. They cannot regulate the Sun's magnetic field, they cannot regulate the cosmic rays that come from outside the solar system, so they have to trivialize and de-emphasize the role of those natural factors. There's no money and additional political power for them if they accept that the Sun is main driver of the planet's climate, whether warming or cooling. Let's have clean air, clean water, clean environment, fine. Regulate lead, mercury, soot, carbon monoxide, methane, CFC, etc., only for their own sake, and not say to "save the planet" because the planet is never in danger. It says how the Arctic ice is slowly melting because of global warming. With the Copenhagen meeting just 3 months away, all the panic is setting in. Bureaucrats need hundreds of billions of $ of carbon tax, like Obama's cap and trade energy bill worth around $7.5 trillion from 2012-2030, or around $317B/year on federal carbon taxes alone, on top of existing environmental taxes, on top of carbon taxes by various states like California; hundreds of billions of $ in carbon cap and trade (was $128 B in 2008, from private corporations alone in EU and Japan), of several billion $ of subsidies to wind farms, solar farms, etc. Lie if they must, demonize a useful gas CO2 (the gas that we humans exhale, the gas that plants and crops need) if they must, scare the world as much as possible, so they will get the carbon regulation that they need. Goldman Sachs and many other big banks are too happy to join the bandwagon because they are among the biggest bank-traders of carbon trading. Several years ago, the world had tech bubble burst. Recently, we had housing bubble burst. And soon, a carbon bubble burst. Another financial disaster in waiting. A non-commodity like the gas that we exhale is now a commodity that is traded in billions of $, that will be taxed by governments by the trillions of $. His paper has a short discussion about the Sun-climate link, and why CO2 hardly affects global climate. And if it does, it's for a useful purpose -- helping more plant growth, more agricultural productivity, more trees, more flowers. Two decades ago, the symbol of dictatorship and communism in Europe, the Berlin Wall, was torn. Tearing down that wall signaled the impatience of people living in previously communist states in eastern Europe to experience economic freedom and political democratization. Two decades hence, various walls -- political, economic, social, cultural, religious, etc, -- to individual liberty and economic freedom still remain, some recently erected. Thus, the persistence of people and groups to tear down those walls in their small and limited capacities. The Atlas Economic Research Foundation (www.atlasnetwork.org) is the first global institute that formally introduced me to the global free market movement, a loose network of independent think tanks and public policy institutes, as well as organizationally-unaffiliated individuals who believe in advancing individual liberty, limited government and competitive markets. That was in 2004. Atlas introduced me to a number of great minds from many countries around the world that advance those ideals, during the Mackinac Leadership Conference in Midland, Michigan, the 4th Atlas Liberty Forum in Chicago, and various meetings and visits of free market think tanks and leaders in Washington DC. Atlas also sponsored me in 3 regional conferences of free market think tanks and individuals in Asia: Hong Kong in 2004, Phuket, Thailand in 2005, and Kuala Lumpur in 2006. Then Atlas sponsored again my participation in the 8th Atlas Liberty Forum in Atlanta last year, and the 9th Atlas Liberty Forum in Los Angeles last April. Now, this is not to brag the cities that I have visited due to Atlas sponsorship. Rather, to show how Atlas trusted me and MG Thinkers, to show how Atlas inspires me and our think tank here in Manila, Minimal Government Thinkers, Inc., to do more, to work more. Whatever work, political and philosophical campaigns that I and our think tank, MG Thinkers -- like opposing price control, more regulations, more taxation -- is doing, credit Atlas for the philosophical support and organizational networking it has extended to us. There is another global institute that supported me and MG Thinkers the past few years. The Internatiional Policy Network (IPN, www.policynetwork.net) in London also provided us a number of important resources. Last May or June, Atlas and IPN jointly sponsored a global campaign to further promote free trade, the Freedom to Trade (F2T) coalition (www.freedomtotrade.org). MG Thinkers is among the 80 think tanks and independent institutes from many countries that belonged to this coalition. Well, we are the only Philippine-based institute that belongs there, as far as I know. Last September 1, Atlas launched a new and unique project -- Tearing Down the Wall project (http://tearingdownthewall.org). It's a simple project with very simple timetable: collect at least $20,000 in 20 days (ie, until September 20) to fund the travel and participation of a number of freedom champions from many countries around the world, to commemorate and discuss the fall of the Berlin Wall, the fall of communism in Europe, and the persistence of communism in very few countries these days and communist-type of public policies in supposedly capitalist countries. That amount is not enough of course, to fund a big number of freedom champions that Atlas wants to bring to Washington DC in November this year. There is a group of rich donors in the Atlas network who will put up a counterpart fund for the total donation that Atlas can get and mobilize. So that doubles, if not triples, the amount of money that Atlas can tap for its important activity two months from now. May I invite you friends, to visit the site and make some modest donation to the Tearing Down the Wall project. $10, $20 donation will be cool and will definitely go a long way in helping promote individual freedom. Freedom from intrusive governments who sometimes think that individuals are stupid enough that they should be guided by a nanny State to protect them from harming themselves. Freedom from the philosophy that government should socialize everything -- education, housing, credit, healthcare, transporation, energy, etc. -- and also socialize our pockets. our personal and household savings, even socialize our dreams and personal liberty. “No one should die because they cannot afford health care, and no one should go broke because they get sick.” If you agree, please post this as your status for the rest of the day. I think the above requested quote is an offshot of the hot debate in the US healthcare bill. (2) …We should have a health system patterned after UK.That way...patronage politics does not enter into the health care equation. It also avoids future pension and health care headwinds and provides additional incentive in paying of taxes. (3) Health service is a human right. On (1): Not only poor people but rich people die. Cancer, Alzheimers, HIV, stroke, etc. do not choose their victims. It’s just that the rich can probably prolong their lives. Instead of dying within 6 months of a stage 4 cancer, they may live for 1 or 2 year/s. For people with special health needs (like those with physical and mental disability), I would concede that government should come in to help and provide subsidized health care. Governments should not over-tax parents and over-regulate private healthcare enterprises. Over-taxing the income of parents reduces their disposable income. Over-regulating private hospitals, clinics, pharma and health insurance companies, result in reduced competition and high operating costs that those enterprises will pass on to their patients. On (2): Health socialism often results in health rationing. Demand will always exceed supply. A person suffering a headache will most likely demand lots of diagnostic tests to ensure that he does not have cancer or tumor or whatever disease. Anyway diagnostic tests and physiciian visits are free. With health rationing, health bureaucrats will determine who needs prompt health care, who should wait 6 months. On (3): Not all the time. People who drink 7 nights a week, smoke 2 packs or more a day for many years, over-eat fatty food and have sedentary lifestyle, get into frequent fights and rumbles, live promiscuous lifestyle, etc., then when their intestines or lungs get mutilated, they run to the State and demand that "quality healthcare is their right." Health socialism – like education socialism, housing socialism, or socialism in general where the rich will be over-taxed and the poor will be subsidized, regardless of the circumstances of their poverty – will always remain a populist and emotional issue. Understandably so because once a family member gets sick, especially chronically sick, the rest of the family will be restless and worried. Not only about their health condition but also about the financial drain that sickness will bring. With health socialism, the most common target of attack are the big companies – pharmaceutical and health insurance companies, hospitals and clinics, diagnostic and lab test centers – and the rich physicians and other health professionals. Governments are seldom seen as a contributor to expensive health care. For instance, people often lambast the multinational pharmas for expensive medicines but they turn a blind eye on high and multiple government taxation of medicines. People attack the private health maintenance organizations (HMOs) for their expensive health premium but turn a blind eye on government multiple regulations and taxation of such companies. Government does not have the monopoly of providing quality health care to the citizens. There are hundreds of voluntary organizations that provide free health services to the poor: civic groups like Rotary, Lions, Masons; religious groups like CFC and Christian groups. Such groups, professional associations and individuals do it with zero taxes, zero bureaucracies, zero politics. Nonetheless, I thank facebook for allowing, even encouraging, this kind of spontaneous and unscripted exchanges among people. Information technology is really wonderful. Bureaucratism is not. * health care costs will average $8,160 this year for every man, woman and child, an increase of $356 per person from last year. * number of uninsured has risen to about 48 million, according to a new estimate by the Kaiser Family Foundation. * health costs will reach $13,100 per person in 2018, accounting for $1 out of every $5 spent in the economy. Since the Obama administration has promised lots of welfare program for the citizens of America, the soaring health care costs should be a very burdensome issue that his government will face. But is health care entirely government responsibility? I have always believed that only for a few public health issues like epidemics and diseases of babies and toddlers, health care should be personal and parental responsibility. So when the latter is accepted as public policy, then government should get out over-regulating health insurance, and allow competition among private health insurance companies to provide different services at different terms and prices for different sets of people. Yes, no need to put lots of tax money for health care, and no need to impose high taxes to finance public health care. Because responsible people will take care of their body and avoid alcohol/tobacco/drugs abuse, live sedentary and cough potato lifestyle, and so on. And people will be able to choose which kind of various health insurance packages will fit them given their health condition and personal or household budget. All of us are going to die anyway. If health care will remain a "government responsibility", then some people will insist that their medically-hopeless condition, or very expensive-to-treat diseases, should be shouldered by the government and the taxpayers at large will foot the bill. This is health socialism and it is counter-productive to society over the long-run. Innovation is always the engine for change and growth in any individual, enterprise or society. Life becomes interesting and exciting only when there is always something new to see and try, something new to sell and buy, even something new to give away for free. Innovation is encouraged under a competitive environment. When there is no competition, there is very little incentive to innovate. A monopolist that supplies a particular commodity to a community and it is assured of zero competition for the next 20 or 100 years, will have very little incentive to innovate. Why spend money on expensive research and developing a new and better product when consumers do not have any other options anyway except buy their product no matter how lousy it is? People change, communities change and evolve. Diseases also evolve. What used to be considered by the people as an ordinary flu is now seen as various strains of flu – bird flu, cat flu, cow flu, swine flu and so on. The attitude of people towards diseases also evolve, they become more demanding if not impatient as they assume that new medicines are coming to cure them within a few days and not a few weeks or months. The traditional sources of medicine innovation are the pharmaceutical multinational corporations (MNCs). These are huge corporations which have the resources and network to test and develop new drugs to respond to different patients with different diseases with different budget. But more local or nation-based pharma companies are also sprouting up, first to develop off-patent and generic medicines, and later on to start developing their own new concoction and medicines which are both safe and effective. And still slowly emerging, are individual researchers and non-government organizations (NGOs) which have a clear goal and mission to develop new medicines targeting particular diseases for patients in poorer countries and communities. Champion of Scientific Crusade for Affordable Medicines by “producing much-needed generic drugs in Thailand and elsewhere in the world.” She joined the Government Pharmaceutical Organization (GPO) in 1983 and led its research department in producing many generic medicines for a wide range of illnesses. In 1995, Krisana produced the world’s first generic ARV, a generic AZT (zidovudine) for HIV that reduces the risk of mother-to-baby HIV transmission. In 2002, she left the GPO and went to the sub-Saharan Africa region, hit hardest by the AIDS pandemic. Among the countries she visited and worked with, “In war-torn Democratic Republic of Congo, she set up a pharmaceutical factory that was able to produce generic ARVs after three years.” In Tanzania, she upgraded an old facility to produce not only ARVs but cheap anti-malarial drugs as well. The Inquirer has a special news report about her, “RM Awardee: Cheap drugs for poorest”. Krisana’s initiatives are good. Those who have the expertise and capacity to produce more competing products made whether by multinationals or local pharma companies, should join the competition. More competition is always good for consumers and patients. I would add that local pharmas should aspire to become multinationals themselves someday. Like San Miguel, Jollibee, Figaro, SM, and Metrobank, etc., companies that previously were just confined to the Philippines, now selling their world-class products and services in several countries around the world. Yesterday, I and other NGO leaders under the Coalition for Health Advocacy and Transparency (CHAT), the civil society partner of the Medicines Transparency Alliance (MeTA) Philippines, had a great opportunity to meet up with Krisana. She was joined by the current Director of the Research and Development Institute of GPO, Ms. Achara Eksaengsri. After an overview of the Philippine health and pharmaceutical situationer given by former DAR Secretary and now President of HealthWatch Philippines, Obet Pagdanganan, we had a productive free flowing discussion. Among the topics that we explored were the following. One, more competition among pharma companies in Thailand than in the Philippines. In Thailand, there are 167 local pharmas and about 500 multinational pharmas operating. In the Philippines, I could count only about 50+ local pharma and about 40+ multinational pharmas. That’s from the members of local pharma association PCPI, and mostly multinationals pharma association PHAP. This partly explains why medicine prices in Thailand are generally cheaper than in the Philippines. Two, there is no drug price control law being implemented in Thailand, but they have issued compulsory licensing (CL) on 7 drugs against hypertension and cancer. The Philippines has current drug price control program but has not issued CL on any essential drugs yet. Three, there is no single dominant drugstore in Thailand, unlike in the Philippines where Mercury Drugstore corners a big portion of the drug retailing market. The most dominant player usually could set its own price or profit rate much higher than competing drugstores’. Former Sec. Obet’s figure is 60 percent share by Mercury, but I think the steady influx of many new drugstore chains like Watsons and The Generics Pharmacy, plus the in-house pharmacies of private hospitals and clinics, should be eating away the market share of Mercury to only 50 percent or less. Four, both the Thai and the Philippine governments impose taxes on medicines, despite their high profile pronouncements that they want “cheaper medicines”. Thailand has up to 7 percent import tax and 15 percent value added tax (VAT) on medicines. In the Philippines, up to 5 percent import tax on finished products, 3 percent on raw materials, and 12 percent VAT. The latter also imposes VAT on tolling fee which can be claimed as input tax credit against imported drugs’ sale of the tolled product, and VAT on the sale of the tolled product to distributors. Then there are import processing fee, import documentary stamp tax, and local government tax. The government charges the 12 percent VAT on the landed price of imported drugs plus the other taxes and fees. The VAT in effect, is a tax on a tax. To my mind, both governments – and many other governments – are hypocrites for calling for cheaper medicines but contributing to expensive medicines because of the various taxes and fees they impose on medicines. They treat drugs as no different from alcohol, beer and hamburger that must be slapped with as many taxes as possible. Five, Krisana says the role of NGOs is very important in their work in Thailand in producing alternative cheaper essential drugs, and she believes the NGOs in the Philippines are also playing a crucial role in health policy debates. She calls the Philippines’ Cheaper medicines law (RA 9502) “the best” law that she has recently encountered. I fully agree that NGOs and civil society groups have an important role in various public policy debates, especially in health issues. But said NGOs should not behave or expect like they are adjunct or an “annex” of the government, by easily running to the government to seek for more regulations and interventions. Here in the country, the President who signed the Executive Order (EO) on drug price control as pressured by some NGOs and media people, is the same witch that created endless political and business scandals that include large-scale corruption charges, the same witch that wants to be the Prime Minister of the country by attempting to bastardize the Constitution so she will be in power as long as she wants. NGOs and civil society groups should fiscalize the government in power because even the opposition political parties are not really intent on changing certain policies like medicine taxation because they also want to implement the same regulations and taxation once they are in power. Not a single big politician or political party in this country for instance, has proposed to abolish certain taxes on medicines to contribute to cheaper medicines. Civil society groups should take up that role as voluntary representatives of consumers and ordinary taxpayers.